Go to your local McDonald’s restaurant and donate your spare change in the RMHC canisters. Of course you can do this everyday, but we would love to have you come in on Thursday (Day of Change) — we will be in several of the locations around lunch and dinner time with some goodies thanking you for your support. Check out the full listing on the Day of Change event page. Donate your spare change online — we have created a special donation page JUST for Day of Change. If you can’t make it to a McDonald’s or prefer to give from the comfort of your home, you can still be a part of the movement. Donate online and you will receive some special images to share with your friends in your email or on social media. 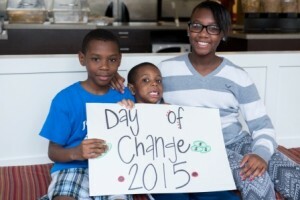 Share your Day of Change or Ronald McDonald House story. Invite your friends and help us spread the word. Collect change with your co-workers, family, friends, etc. This year we have custom Donation Boxes that can be given to groups or organizations leading up to Day of Change so you can collect for RMHCA. These cardboard like boxes are similar to the RMHC pop tab houses and are a great way to collect change for RMHCA wherever you are. If you or your organization is interested in collecting change #forRMHC and would like one (or more) of these boxes — please contact Laurie at laurie.smith@rmhca.org or (205) 638-7269 to coordinate. 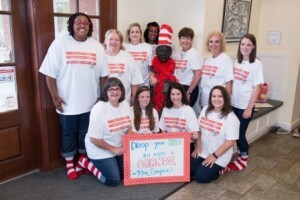 Donate $10 and get your own pair of red & white striped socks! If you go to one of the McDonald’s locations that staff and volunteers will be at, we will have socks on hand (see event details) or you can come by the House (1700 4th Ave S) anytime between 8-4 to get some socks. Share your support — and stripes! Be proud that you are supporting RMHCA and tell everyone — share it on your social media, tell your family, send an e-blast to your co-workers — however you want to share it! Don’t be afraid to show off those red & white striped socks either! Day of Change is a special day where we celebrate the anniversary of the very first Ronald McDonald House that opened, but those Donation Boxes at McDonald’s cash registers are there all year long. All of that money stays local and is handled by a 3rd party until it is safely delivered to RMHCA (or the closest House to the location you donated). We are so excited for Day of Change and we hope you are too! Drop your change and make a change!